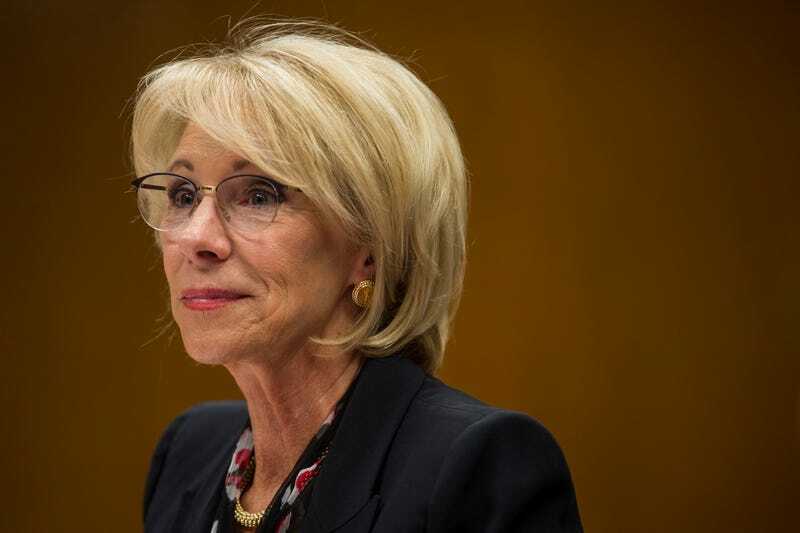 Secretary of Education Betsy DeVos testifies during a Senate Labor, Health and Human Services, Education and Related Agencies Subcommittee discussing proposed budget estimates and justification for FY2020 for the Education Department on March 28, 2019 in Washington, DC. The most sinister PTA mom, Education Secretary Betsy DeVos, is going to war with affirmative action, and at least one school has caved to the pressure. According to NBC News, race will longer be considered in deciding admission at Texas Tech University medical school, which is bowing to the Trump administration’s push to end affirmative action under devious idiot DeVos. Roger Clegg—president and general counsel of the Center for Equal Opportunity, which opposes affirmative action—filed the original complaint. On Tuesday, the group lit torches in their office and danced offbeat after learning that the medical school had caved. The group also posted a March letter to its website from the Education Department, which noted that internal reviews “does not specifically consider the necessity for continued use of race-conscious admissions policies or whether race-neutral alternatives would be effective in achieving a similar level of diversity,” NBC News reports. The Trump administration’s Justice Department has concerns that the use of race as a factor in admission decisions is unfair to white people cause for concern. “The department, for instance, sided last year with Asian-American plaintiffs who contend in a lawsuit against Harvard that the school unlawfully limits how many Asian students are admitted,” NBC News reports. In 2016, the U.S. Supreme Court granted affirmative action policies a victory, allowing race to be considered when reviewing a college application.